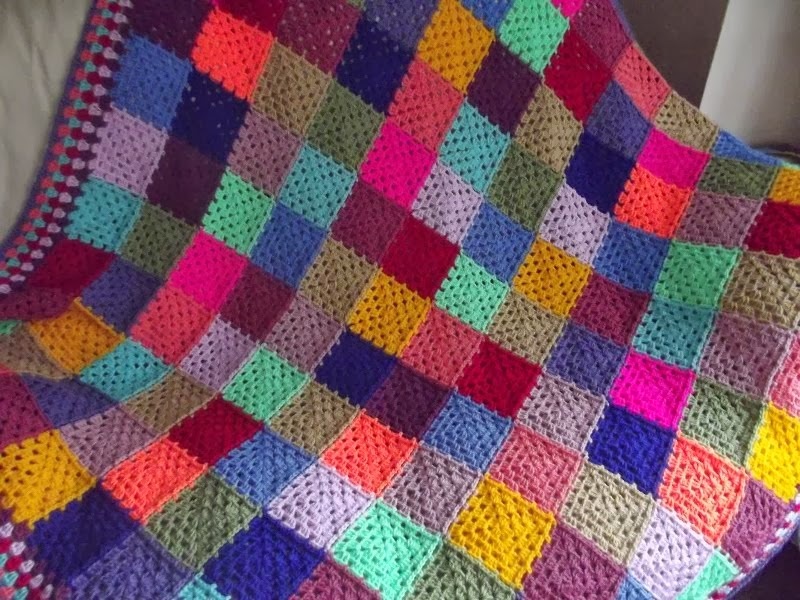 I've seen lots of people making blankets out of small squares, some call them scrappy blankets whilst others call them memory blankets, essentially they're made from bits of leftover yarn from other projects. I've resisted starting one myself, up to now that is. Oh my goodness, what trap have I fallen into? I've made just four squares so far but all I want to do now is add to this blanket. The squares are quite small, just 8cm x 8cm so I know I'll never have enough leftovers to make a blanket but that's where mini skeins come in. I bought a pack of five when I was at Spring Into Wool last month but I know people swap amongst themselves so I shall be up for a bit of that in the future. Each square only takes about 5g of yarn so you don't need a huge amount. They don't look all that neat at the moment but they should even out when more squares are attached. 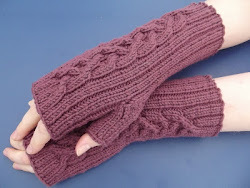 So far I've used Third Vault Yarns - Dragon Scales, Laughing Yaffle - Mango Tango, one of the minis I bought in a set from Rosie's Moments, and Fondant Fibre - Amazon Orchid. I suppose it's a good way to use up all the leftovers, but of course, as with most stash busting projects, I'll end up buying more yarn for it. What do you do with the leftover yarn you have from a project? Yes they are addictive - the old scrap blankets. I tend to crochet mine, I have a couple finished and one on the go. Either that or I crochet squares and make them into bags, my husband once said if it isn't nailed down you'll cover it in crochet. 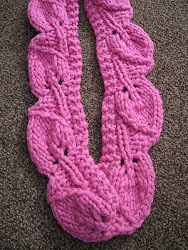 I've seen a few crochet ones around too, I love how all the different yarn works together. 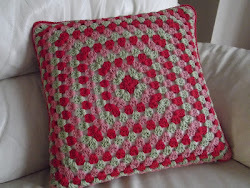 I like the idea of making bags with crochet squares. I would end up with the biggest blanket in the world as the squares are just about what I could manage. 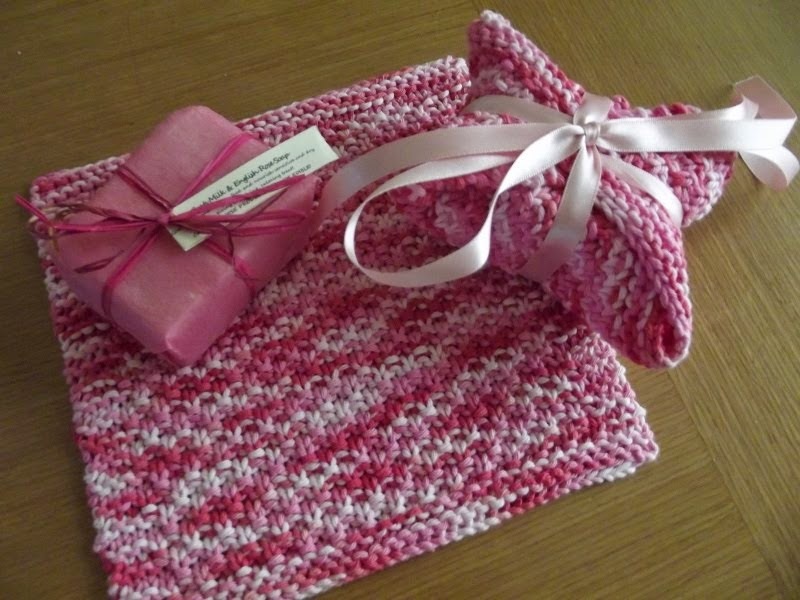 The squares are great for using up scraps and they don't take very long to knit either. I tend to buy yarn when I find a pattern I want to knit, so I don't get too much left over. I did have a small stash of cheaper wool, which I gave to a lady who knits baby blankets to be sent to Africa, babies there often only have newspaper to be wrapped in, so my friend sends blankets. Love the colours so far. I tend to over estimate how much yarn I need for a project, I don't like playing yarn chicken, so I often end up with leftovers. The baby blankets sound like a worthwhile project. 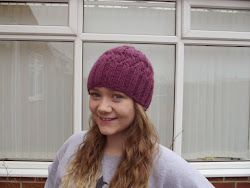 Your knit and natter group sounds good, I wish I could find something similar near here. 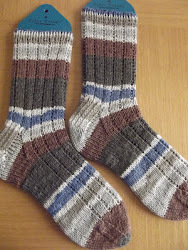 I don't think you can go wrong with socks, you know I'm a big fan of hand knitted socks. I love the names of the yarn, conjuring up all sorts of images. Coasters, pompoms and dolls clothes are great ways to use up scraps. I'm always fascinated by the names of yarn, I don't know how the yarn dyers come up with them. You have some good ideas for leftovers. LOL...had to laugh about using stash vs buying more. That's often the case. 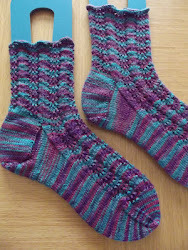 I started one where I was using stash...but didn't have enough of that weight so needed to buy more. Are you sewing together as you go? Love all the colors. The beauty of making pieces parts type ghans is the ease of taking a little something with you. I rarely manage to make a complete project out of stash, there's always more yarn to buy. 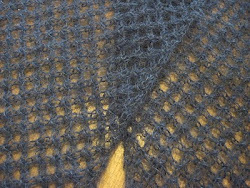 I'm picking stitches up so there's no sewing to do, that's definitely one of the things which appeals to me as I hate seaming. :-)))))) I save myself from "falling in love" with different knitting ideas. By not learning to knit. 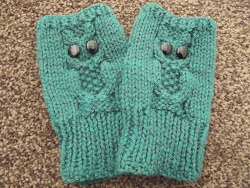 I've been able to knit since before I can remember, it's the sewing gene which passed me by, something I've never really done. It's definitely a long term project but one which will get added to as and when, no pressure. IT is going to be a fun project Jo. Right now I just have a basket of leftovers, I am not a sock knitter so most of mine are all different weights. Still I hope to make something with them. I did give a bunch of small balls away last year for someone else to have fun with. The leftovers soon add up when you knit or crochet lots of things. It can be fun finding things to do with them. I won 26 mini skeins in Josie Kittens giveaway in aid of BHF.I haven't decided what to do with them but it will probably be a blanket.I may then give it back to JK for another giveaway. Congratulations on your win, there were some wonderful prizes in the giveaway. That would have been an ideal prize for me as I embark on my scrappy blanket. 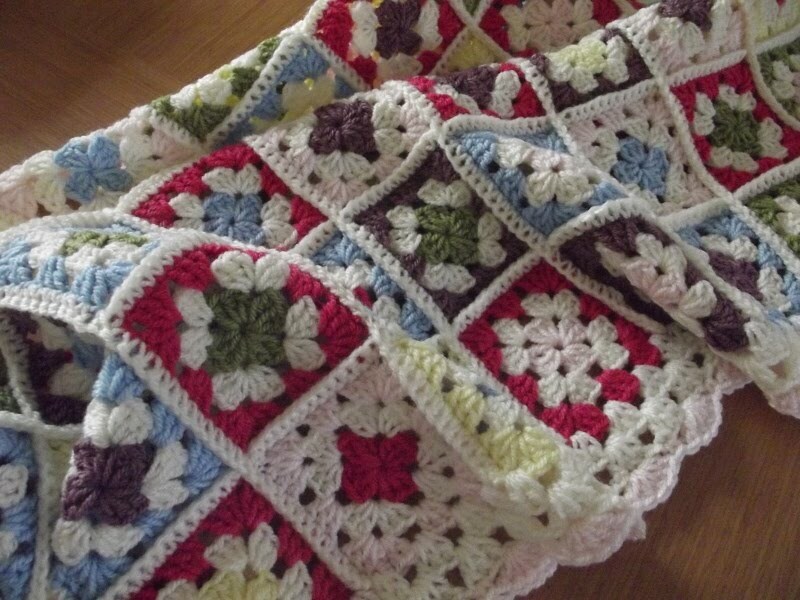 These scrappy blankets seem to be very popular at the moment, the squares are certainly fun to make. There's no getting away from it, yarn lovers are going to purchase yarn whatever! I love a scrappy blanket, a lot. I am thinking about making a scrapy cushion cover next though. I suppose there's an unlimited number of ideas that can be made with scraps. 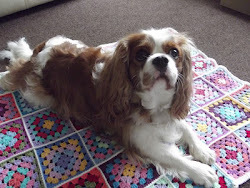 I like the idea of a blanket as it's something which will be long term and will take up so many scraps. It's going to look wonderful when it's finished plus have all those memories. It's nice to think of memories being knitted up into the blanket. It will be fun in years to come trying to remember all the different projects the yarn has come from. I've made an 80 square one (at least i think it was 80) and I've still a TON of wool left over.... and it was all scraps. The squares are very, very, very addictive ! it took me well over a year to finish. 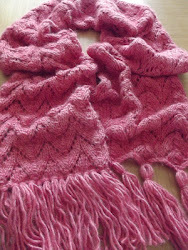 I started knitting as singles, as couldn't follow the join as you knit, until one day , I made myself do it and away I went. I have all the lines going the same way in mine. I really do love it ! I've only done these few squares and I can see how addictive it will become. I had to think about the lines and decide how I would arrange them, I thought it would be fun to have them all radiating out from the centre four squares, I'm looking forward to seeing what it looks like as it grows. 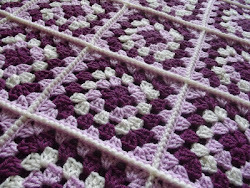 I love the idea of scrappy blankets & can see how it can be quite addictive, especially as a square can be finished up in no time at all - it's quick gratification for the knitter! I'm sure I'll end up making one at some point - looking forward to seeing how yours progresses! 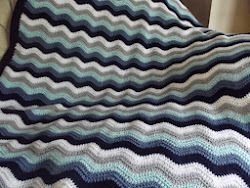 I know I'll never have enough scraps with which to make a blanket so I tried to resist starting one, honestly I did, but the pull was too great. All those lovely mini skeins I'll just have to buy now! I've made plenty of crochet blankets but never a knitted one before so it's something new for me and I'm really enjoying it so far. I've started making crochet squares Jo and will be sending them to blankets for the homeless, either as squares for joining or as a blanket depending on how much time I've got. That sounds like a worthwhile cause. We, as crafters, end up with so many leftovers, it's good to find something to do with them. 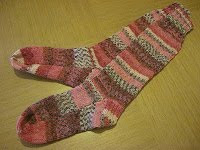 There seems to be a lot of people who use leftovers and scraps for charity knitting, much better than wasting it. 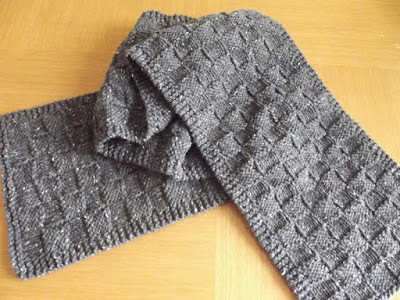 I think these type of blankets look so lovely, happy knitting. I do too. I tried to resist starting one but the pull was too great. I've made blankets out of crochet squares in the past but never knitted ones so it's about time I rectified that. I remember them in lots of houses when I was a child. I've pledged to make a scrappy quilt from my patchwork leftovers which, if I ever make as start, could end up enormous bearing in mind the amount of scrap fabric I have. I bet you could make several scrappy quilts out of all your leftovers. That's the thing when you make lots of things, the leftovers mount up. 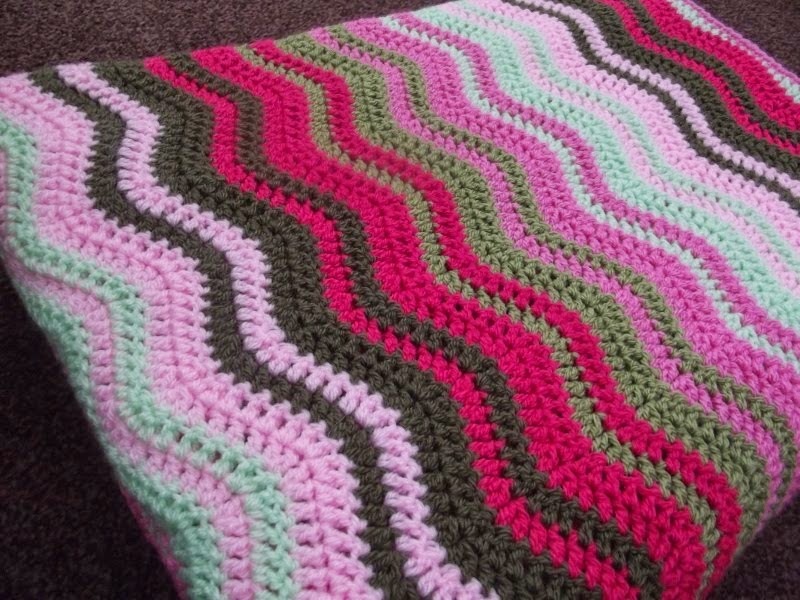 Oh I love your new start Jo, I see lots of these blankets on podcasts, they are lovely and a great way to use up scraps of yarn. I will look forward to seeing yours grow. It will be a long term project but it's a good way to use up odds and ends and it's about time I started a knitted blanket, all the previous blankets I've made have been crocheted. What a great new project you've just embarked on. I am looking forward to seeing this blanket grow over time. The finished project is going to be a lovely surprise because if you're going to be swapping at the moment you don't know which colours are going to be incorporated. It will certainly be random. I think it's a project which will keep my interest because of all the different yarn making it up. I can see how this would become addictive! I tend to jut knit small toys, so i don't have many leftovers, I use them for the toys. 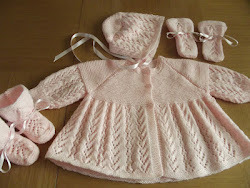 I tend to buy wool in charity shops for my projects, so it's all very eco-friendly! 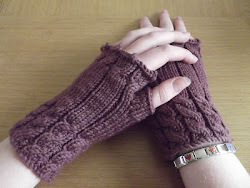 I like the idea of mini skeins, that's a super idea. Toys are great for using up leftovers and if you're buying yarn from the charity shop anyway it's a win win situation. Mini skeins are great, I see that some of the commercial companies are selling yarn in smaller quantities now too.